This weekend I was looking through some pictures and came across my daughter's 4th birthday party. 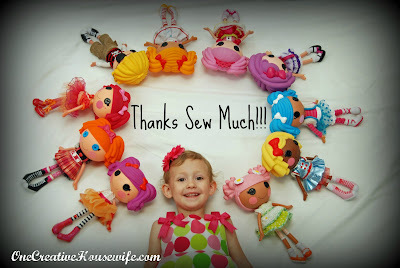 I figured I would share it in case some of you have little girls that are as crazy for Lalaloopsy as my daughter. 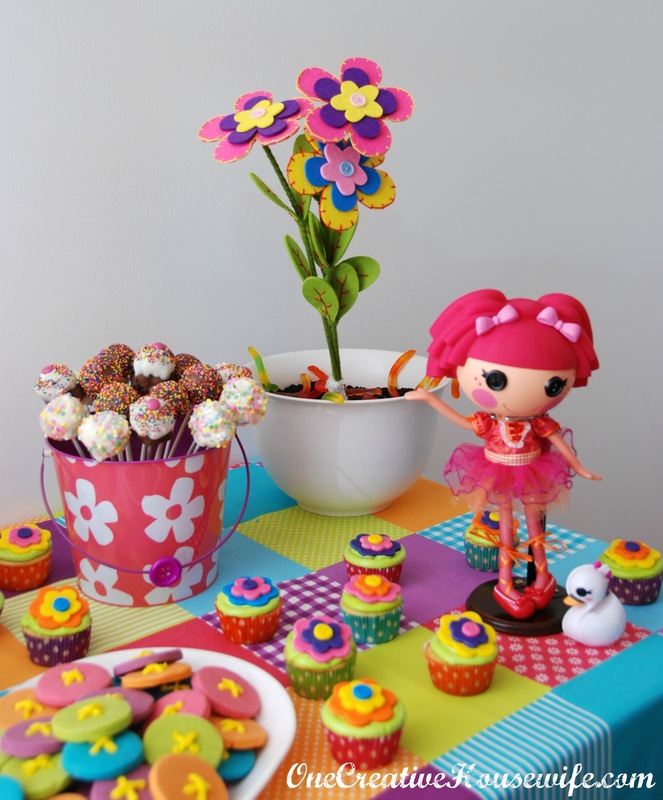 My daughter absolutely adores all the Lalaloopsy dolls. She knows all their names and plays with them everyday. 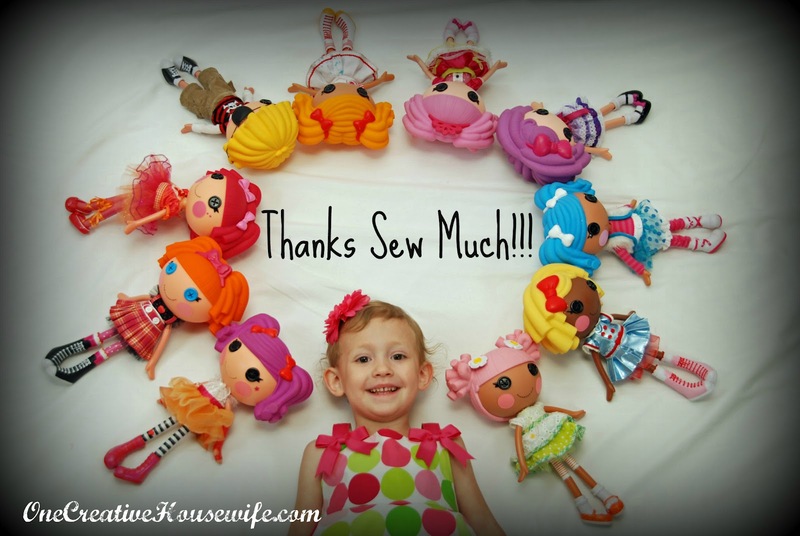 Peanut Bigtop is her favorite doll, she is a circus themed doll with a purple pet elephant. 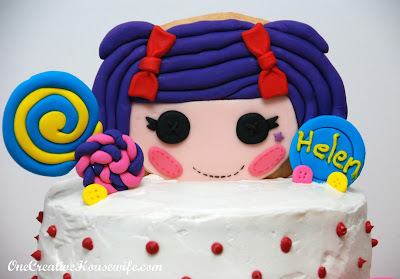 Peanut was the inspiration for my daughters cake. One layer of the cake is white cake and the other is chocolate. 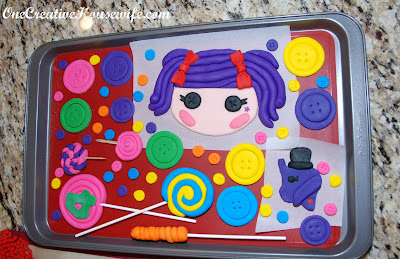 Both are covered in buttercream icing, it was suppose to mimic her outfit (white and red top, pink belt, orange skirt). The accents on the cake are made of fondant. Peanut's head is fondant attached to a sugar cookie with icing. Besides the cake we had plenty of desserts at the party. There were cookie dough cupcakes topped with buttercream icing and fondant flowers and buttons. 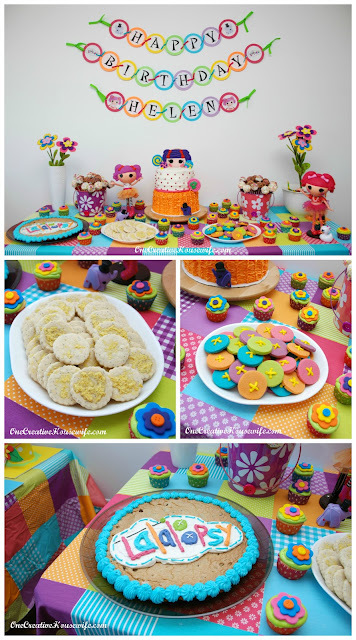 We also had lemon poppy seed cookies, multi-colored button shaped sugar cookies, and a giant chocolate chip cookie decorated with the Lalaloopsy logo in buttercream. We also had 3 different flavors of cakepops, and of course no party is complete without some "Dirt" pudding dessert. The flowers in the "Dirt" were from Micheal's craft store. I made a small candy bar with Sixlets, candy dots, pixy sticks, and candy necklaces. The tablecloths and buckets were on clearance from Target at Easter time. I used thread and tied buttons on the buckets handles. 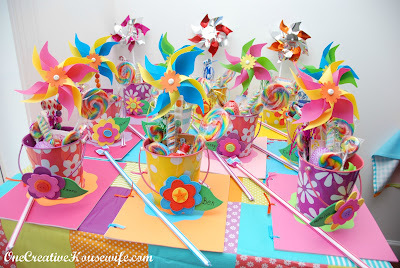 The pinwheels are from the dollar store and I glued small buttons in their centers. 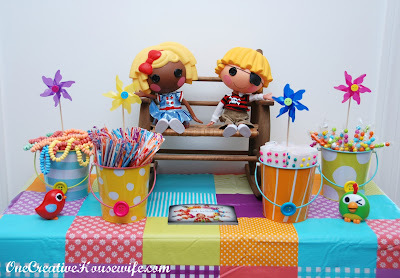 I used the same buckets for the favors and used foam shapes, buttons, and pipe cleaners to make name tags for them. 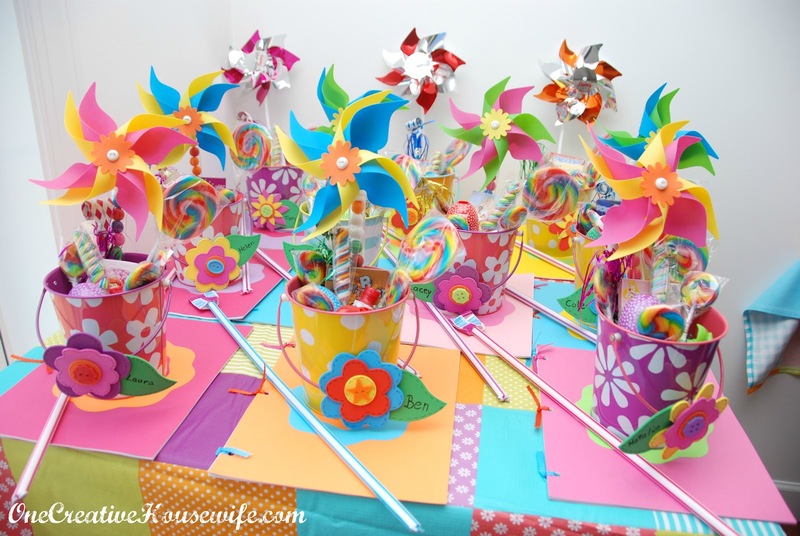 The favors were pinwheels (some with gum and some without for the little ones), giant pixy sticks, lollipops, crayons, bubbles, gumdrop prisms, kazoos, and a homemade coloring book. I made the coloring books using coloring pages from One Love Designs on Etsy, cardstock for the covers, and bound them with ribbon. 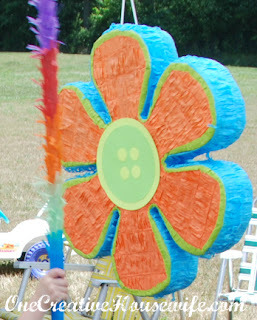 We had a flower pinata from Party City. 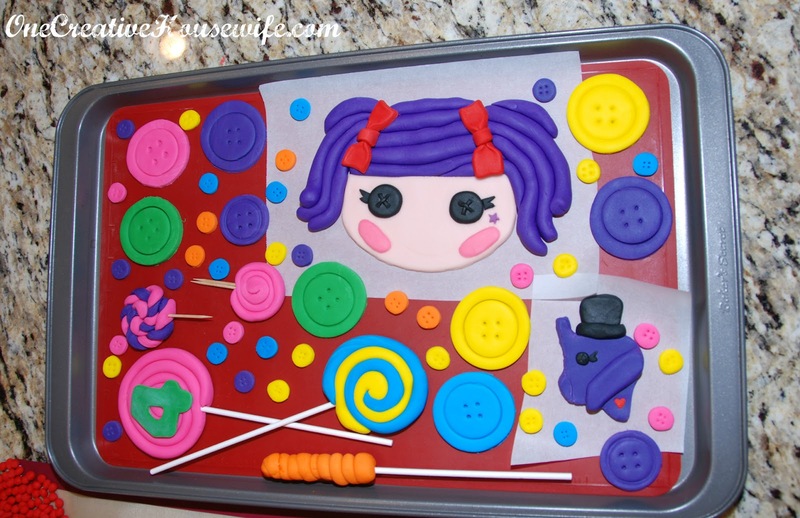 I placed a button made out of cardstock in the center of it, to make it more Lalaloopsy-ish. 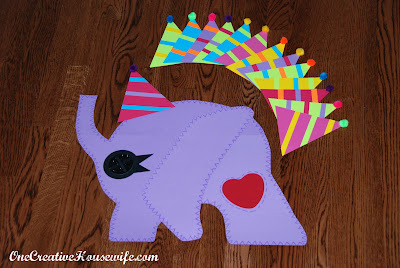 We also played pin the party hat on Peanut's elephant. I made the elephant and party hats out of cardstock and pompoms. I used blue painters' tape on the back of them, so they were easily removable to play the game. Unfortunately I don't have a great picture of the game hung up, because there is always too much to do party day. The thank you postcards we gave out were pictures that I had taken and edited, of my daughter for birthday. I hope this give you some inspiration for a party for a little girl in your life. Oh my goodness! What a fun party. And so many amazing details! Well done! Love all the bright colors and details! Adorable! Wow, this is incredible. Your are so talented! Thank you for the lovely compliment and for stopping by! may I ask where you got the stand for the dolls? I just recently had a LalaLoopsy party, it was not as beautifully done as yours! You are amazing! I did however get my invitations from YellowLemons on etsy. she was great and my invitations were perfect, now if I can get you to come to my next party I think it will be well decorated too! love the ideas here!! any chance you still have those tablecloths and would be interested in selling them? :) my daughters love lalaloopys. they are taking over my house and i know it will be worse come december as i'm throwing my youngest a lalaloopsy party. 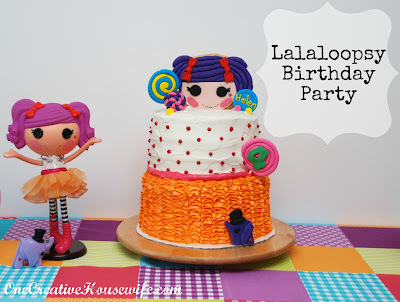 between her party and christmas i'm going to have lalaloopys coming out of my ears! but seriously, love your photos/ideas and if you would sell your tablecloths, that'd be awesome! they are adorable. Where you buy that tablecover. I luv it!! I purchased it from Target. It was part of their Easter line in Spring 2011. That would be my daughters dream party!Very creative! There are a bunch of youtube videos that may help you but i think you may find this on particularly helpful.... http://www.youtube.com/watch?v=Rdd2tDLNPRE I then attach the pieces together using a little bit of water and a small paint brush.